I had this soup a couple times this weekend in Sacramento-could it be because it was 20 degrees there? I couldn’t help but crave soup all weekend long. I love ordering this soup at Italian restaurants because it is packed with vegetables and really helps curb my hunger before all the pizzas/pastas arrive to the table-not saying I didn’t indulge in a couple slices here and there 😉 . 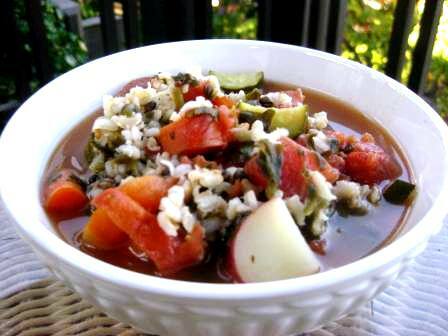 I added whole-wheat orzo to make the soup more filling and ate it as a complete meal, but you can leave it out and have a nutritious and flavorful vegetable soup. This is also another great one pot meal to make during the weekends. Make a couple extra servings so its ready to heat up during the busy weekdays. This version of the Italian classic soup Minestrone is packed with carrots, potatoes, zucchini, spinach and orzo, making it perfect for a hearty lunch or supper on a cold winter’s night. To make a vegetarian version use vegetable rather than chicken broth. Top each bowl with freshly grated Parmigiano-Reggiano for a burst of flavor. Heat oil in a Dutch oven or large soup pot over medium-high heat. Add carrots, zucchini, and potatoes and cook, stirring occasionally, until soft, about 5 minutes. Add broth, diced tomatoes, salt and pepper. Bring to a boil, reduce heat to low and simmer, covered, for 5 minutes. Add orzo and cook, partially covered, stirring occasionally to prevent sticking. Let simmer for 15 minutes. Stir in spinach and cook, stirring, until wilted, about 2 minutes. Season the soup with vinegar and stir in Parmesan cheese. Ladle into bowls and garnish with Parmesan. Hand down my favorite soup!